Corporations have long known that their best employees are successful often because they have acquired skills beyond those needed to be an employee. In fact, the greatest managers and executives learn that skills to inspire and lead others do not naturally come from working as a subordinate. Rather, they come from testing out leadership skills in relationships with others. Companies can let those skills develop on their own – e.g. through the growth of the individual as he or she is exposed to more work-based situations, and as he or she must resolve corporate problems and adjust to new organizational scenarios. But a company is remiss if it doesn’t actively challenge its employees by providing and encouraging these growth-developing opportunities outside of work. In a recent study on business volunteerism and how it attracts, develops, and retains talent, Deloitte found that 92% of the people surveyed agreed that volunteering improves employees’ broader professional skill sets as well as adding to their leadership skills. As a matter of fact, they learned that 80% of active volunteers move more easily into leadership roles and grow their careers further as a result. 1. Mentoring teaches you to plan, to help others execute, and to be flexible--all traits of leadership. As a mentor to a class of students or to individuals, you need to be organized to fill your time productively. You will be potentially teaching a younger mentee applicable real world skill sets. Patience and precision in your communication will be required as you begin to educate a new learner. Meanwhile, witnessing another take hold of a new idea requires your agility and empathy. Ultimately, you begin to understand that your shared knowledge is received by others and how. 2. Mentoring hones your ability to think while you speak. As you become more comfortable presenting to classrooms of students, you will find that your dialogue is less rigid, and more conforming to how the conversation flows. You will start to reorganize your thoughts – and perhaps your entire presentation – based on how your students respond. Being flexible in your implementation and thinking as you “do,” are invaluable traits for a leader. 3. Mentoring positions you as the role model, and the mentees begin to model themselves after your behavior. This is an unparalleled way to learn how to be a leader. Since you represent the little-known business world to students, as a mentor, you think about how to model a successful business person. You think about your appearance, your language, and your style. You teach the mentees how to keep a cool head through obstacles, and how to design a strategy to overcome hurdles. 4. Mentoring gives you confidence. As students model your behavior, and as your internal fears surprise you by turning into successes, you will naturally start to become more confident. This self-realized confidence will make all the difference in your career path – especially when you are presented with new scenarios in business, in which you will have to rely on your own intuition, confidence, and abilities to overcome. 5. Mentoring will prompt you to realize how far you have come, and how far you can bring mentees. As you continue to meet with your students, you will start to think, “Oh! I’ve been here before. I remember when I was their age …” And then you will start to consider how far you have come on your own journey. This will not only contribute to your confidence; it will also contribute to your appreciation of what mentoring brings to these students. In due time, you will see the ripple effect that your presence, your ideas, and your time has had on others. This contributes to a mentor’s new found empowerment. 6. Mentoring builds humility. As adults, we often focus on our achievements when discussing our careers with others. We are trained to tout our successes in our resumes, and to bring out the most hire-worthy aspects of our career during interviews. We might even use industry-specific words that sound like we really know our stuff. With students, however, this approach can be limiting, and even inauthentic. Students already know that certain times require a focus on the highlights, rather than the low points. But those aren’t what are interesting. Students are far more curious about the struggles and the bumps in the road. They want to hear how you thought you were defeated, and what you did next. And to best relate to the students, mentors will learn how to use the language the students speak. Bring the conversation to their level. When you think about the needs of your audience, you become a better leader. 7. Mentoring builds reliability. At one point, you may have been the “I’m-always-10-minutes-late” person. Or maybe you were the quintessential procrastinator. As a mentor, your inclination to be late or to procrastinate will diminish quickly. Before long you will learn how to structure your day accordingly because you will feel responsible to others who need you and who look up to you. What impact will your tardiness have to your mentee? You will learn the value of being reliable to others. 8. Perhaps one of the most elusive, but also one of the most valuable skills, is learning how to listen better. As you grow in your mentorship, you will learn to listen more, and pick up on non-verbal cues. Eventually, you will communicate based on this feedback. A good mentor can take the pulse of the mentees as a dialogue progresses. He or she can learn how to gauge the interest of a class or an individual, and determine if a different tactic should be used. More importantly, a great mentor – and a great leader uses feedback to shape their communication and become even stronger and more effective. And the mentor learns a valuable asset for leadership. As a mentor, you may feel you are learning these traits just so that you can “survive.” But before long, you will see that these traits also benefit you in the C-Suite. In this case, the “giving” does result in the “receiving.” I encourage you to join our cause at www.teachtowork.com. I am confident you will impact your life, by impacting others. 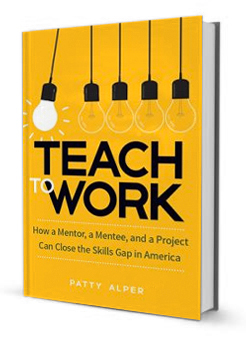 Patty Alper, author of Teach to Work: How a Mentor, a Mentee, and a Project Can Close the Skills Gap in America has been in the field of marketing, communications, and sales for thirty-five years. She's successfully served firms in the real estate, hospitality, finance, and non-profit sectors through her consulting practice, The Alper Portfolio Group, Inc. For eighteen years, she has been a trustee of the Alper Family Foundation. It is through her philanthropic giving that she became engaged with the Network for Teaching Entrepreneurship (NFTE) and how she ultimately developed the "Adopt a Class" program. Alper was honored as the 2010 NFTE Philanthropist of the Year, DC region and currently sits on the National Board. Mentoring is one on one, whereas leadership is between one and many (i.e., followers). Put another way, mentoring is like supervision rather than leadership. 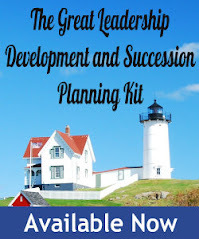 Consider, for example, visionary leadership, or even charismatic leadership. These do not pertain or apply to mentoring. Therefore, I submit that mentoring does not connote leadership.